It's always great to get a 'thank-you'. In this case, the thanks to 'Team Green' have come from the guys at Perfect Day Weddings, the wedding stationery company. Unless you've been living on Mars for the last few years, most of you will have watched the popular Channel 4 programme Secret Millionaire. One of the successful entrepreneurs to feature on the show is Kevin Green, who is the UK's largest private property landlord. But apart from property, Kevin Green is a renowned business coach and mentor to many budding business men and women. His business mentor is none other than Sir Richard Branson, so when it comes to business know-how, Green has been groomed by the best! 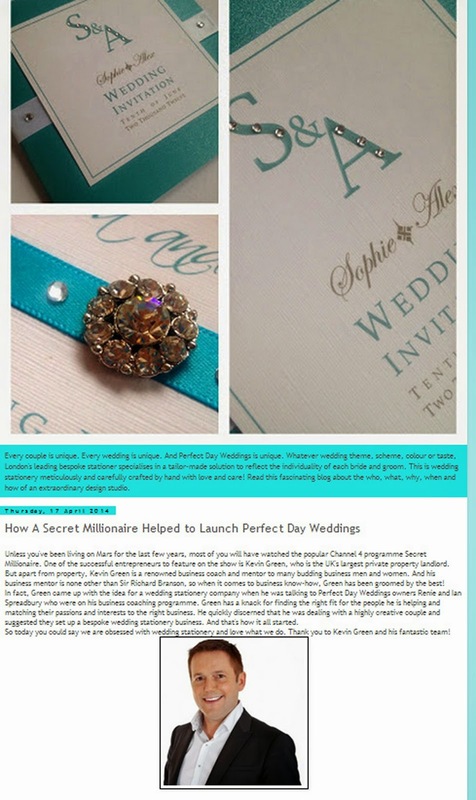 In fact, Green came up with the idea for a wedding stationery company when he was talking to Perfect Day Weddings owners Renie and Ian Spreadbury who were on his business coaching programme. Green has a knack for finding the right fit for the people he is helping and matching their passions and interests to the right business. He quickly discerned that he was dealing with a highly creative couple and suggested they set up a bespoke wedding stationery business. And that's how it all started. So, today, you could say we are obsessed with wedding stationery and love what we do. Thank you to Kevin Green and his fantastic team! Obviously, there's a big 'thanks for the thanks to Renie and Ian - with best wishes for the future success of their business. Everyone who knows me appreciates that I am a bit of a 'petrol-head'. I loves cars and bikes. Recently, I invested in a second-hand BMW R1200 motorbike - great for touring the open roads of West Wales, but also great for getting through the traffic to get to business appointments on time. My son Carwyn has also been bitten by the bug. Last Thursday, I was well chuffed to find out he'd passed his CBT basic motorcycle training certificate. 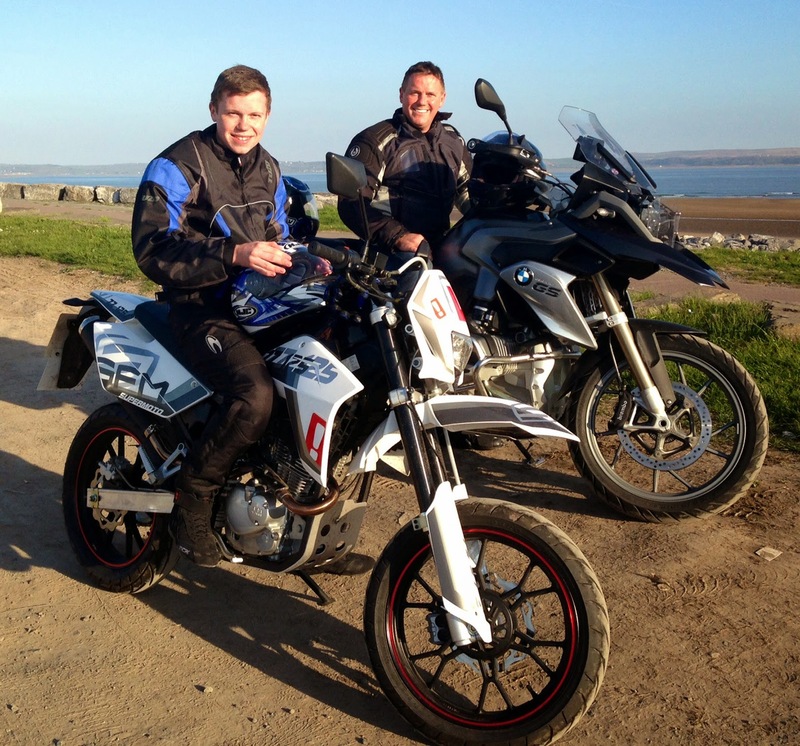 He's invested in a 125cc bike and now father and son are able to tour the highways together. Carwyn is quickly learning motorbike etiquette. He thought everyone knew him until I explained it was usual practice to acknowledge fellow bikers! Friday was a lovely sunny day to be out on the roads. The pictures were taken by Loughor Bridge, the gateway to West Wales! All smiles! I've picked up a new certificate! Plenty of reason to smile here as I've picked up a new certificate. Social entrepreneur and multi-millionaire Kevin Green doesn’t mind getting his hands dirty with some manual labour when it comes to making money. But he’s also been learning how to keep his hands clean – by taking time out from his busy schedule to study for a food hygiene certificate. The 50-year-old property landlord and multi-business owner has been swotting up on food hygiene for a new venture which is very much a family affair. 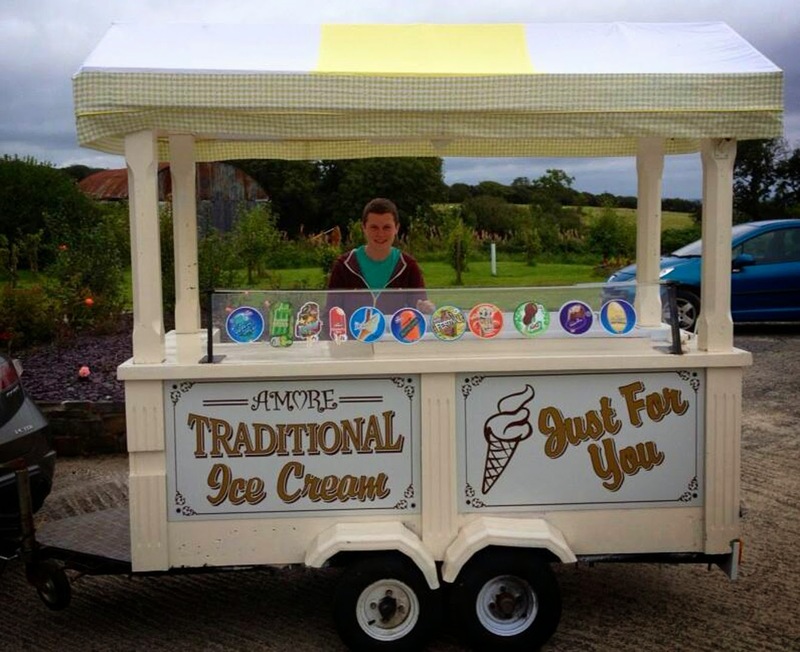 Son Carwyn, already a budding entrepreneur at just 18, has a couple of new business ventures, including one as an ice-cream salesman. Carwyn has applied for all the licences to take his mobile ice-cream stall on the road when the weather gets warmer this spring. 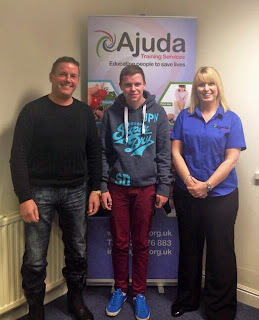 A food hygiene certificate was one of the ‘must-haves’ on Carwyn’s list – and dad Kevin agreed to go along for the ride when he attended a Level 2 food safety and handling certificate course at Cardiff-based health and safety provider Ajuda. Kevin explained: “I actually helped open the new Ajuda Training base last year and the business is run by one of my ‘Kevin Green Wealth’ business coaching clients, Dawn Evans. “As Carwyn was sitting the course, I thought, why not? I may as well sit the course as well as it always pays to learn new things and get new strings to your bow. As a dad, I thought I’d better be on stand-by in case Carwyn wants me to step in and sell a few ice-creams when he is busy! Kevin added: “Carwyn was all set to do a business course at Coleg Sir Gar at one stage last autumn, but he decided he was more of a hands-on type of businessman, so he has developed a couple of business ideas. “One is for property – just like his dad – and the other is the ice cream stall venture. He’s already been working hard in my rentals and lettings business and he’s getting a great grasp of what’s required to succeed in the world of business. “Fair play to him, he’s doing it all for himself. He’s had a little bit of help to transport the ice-cream stall from the auctions in the north of England, but apart from that this will be very much a Carwyn Green venture. Kevin Green is a self-made multi-millionaire and social entrepreneur. He is one of the UK’s largest residential property landlords and a multi-business owner. He lives in Burry Port. Kevin is a member of the panel advising Edwina Hart (Welsh Government Minister for Economy, Science and Transport) on empowering and implementing entrepreneurship from primary school level through to adults. Kevin is a member of the Planning and Resources advisory board at Coleg Sir Gar (Carmarthenshire College), helping shape the brighter future for further education in South Wales. He is also the chair of the Big Ideas Wales Challenge and a Welsh Government ‘Dynamo’ role model. He helped launch the Swansea-based Entrepreneurship Academy for Wales (attached to Swansea College). The 50-year-old dyslexic, who featured on Channel 4’s Secret Millionaire, was homeless in 1988. Today, his property portfolio runs into the hundreds. 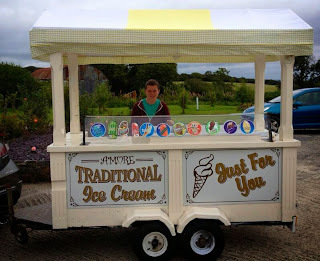 Photos: Carwyn Green on his new ice-cream stand. 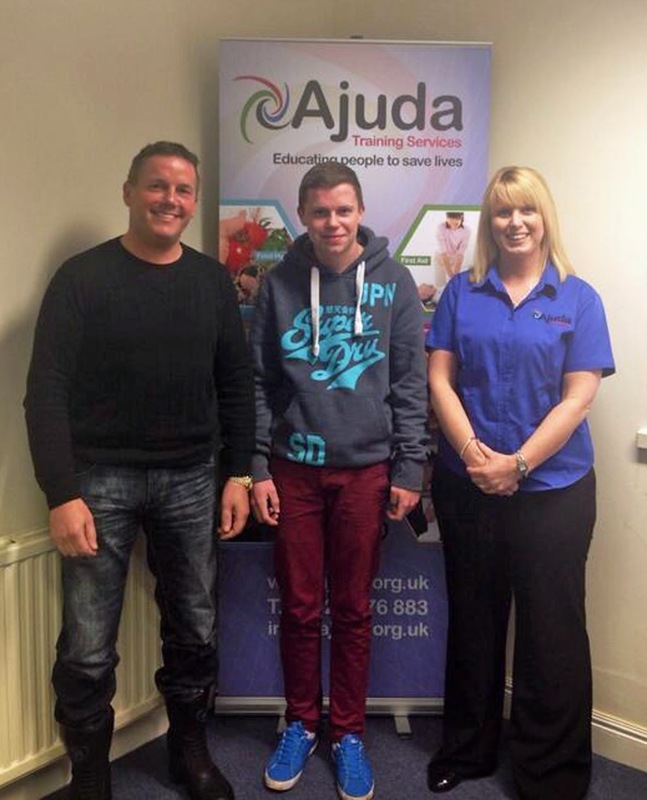 Kevin Green and son Carwyn with Dawn Evans, of Cardiff-based Ajuda Training, after successfully completing their food hygiene certificates.